Grey Langurs are a group of Old World monkeys previously thought to be one species, which have since been separated into seven species within the Semnopithecus genus. The species protected by the Elephant Corridor Appeal is the Southern Plains Grey Langur. Grey Langurs have fine silver fur, with black faces, ears, fingers and toes. Their tails are longer than their bodies and are used dextrously to manoeuvre through the canopy. They are sometimes referred to as the Hanuman Langur, after the Hindu monkey-god Hanuman, and are considered sacred in Hinduism. 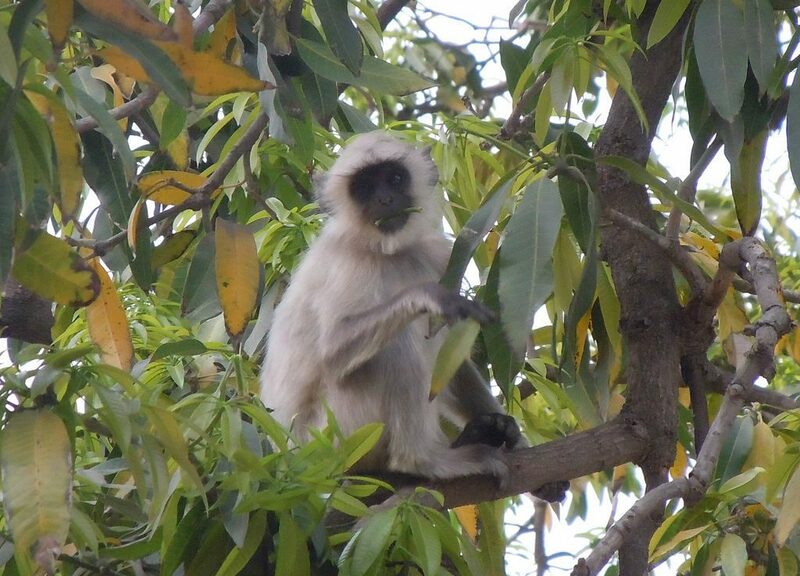 The Jungle Book referred to Grey Langurs as the ‘Bandar-Log’ which translates from Hindi to ‘monkey people’, a troop of squabbling anarchists who are shunned by the rest of the jungle. However, social groupings of Grey Langurs have a dominance hierarchy, with high-ranking males engaging in aggressive displays, vocalisations and fights with each other to determine mating success. Females have a separate hierarchy where rank is based on physical condition and age, and relationships between females tend to be positive with grooming to establish and maintain social bonds. Dominant males win the most matings and sire most of the young. The gestation period is around 200 days and females usually give birth to a single infant, which are weaned after 13 months. Infanticide is common in groups of grey langurs, as when outsider males take over a group and drive out the previous dominant males they kill all the infants. They also have mutualistic relationships with ground-dwelling herbivores such as cattle and deer, which often browse underneath groups of foraging langurs to eat the food dropped or dislodged by the monkeys. If a predator is detected both species will react to the warning call given by a sentinel. The Southern Plains Grey Langur is primarily herbivorous and feeds on a wide range of plant matter, from leaves, fruit, shoots, roots, grass, bamboo, ferns, coniferous needles and cones, mosses and lichen. This means they do not live in specialised habitats, and can be found at various altitudes in tropical rainforest, dry deciduous forest, sacred groves, gardens and open scrub. 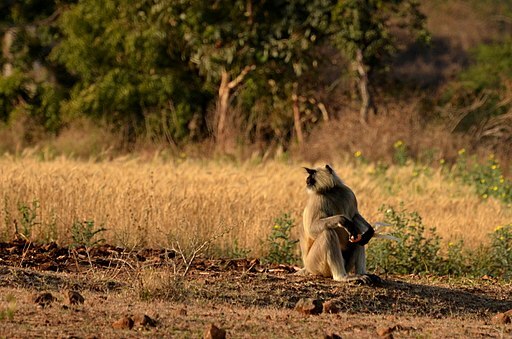 Grey Langurs are under protective laws in India which forbid people from killing or capturing them, but lack of awareness and enforcement means these langurs are often kept as pets, for roadside performances, for religious purposes by Hindu priests. Additionally, they are also occasionally hunted for food and medicinal purposes, and certain parts of their bodies are used as lucky amulets. Although they are considered less aggressive than other primates, they are occasionally persecuted for their crop-raiding and food-stealing behaviours, especially in towns and cities. The populations living in urban habitats are also subject to accidental mortality on roads. Their biggest threat is considered to be logging, agriculture and slash-and-burn (jhum) practices which are encroaching on natural forest habitats. However, as Southern Plains Grey Langurs have successfully adapted to urban habitats and are common in their widely distributed range, they are listed as Least Concern by IUCN Red List of Threatened Species.